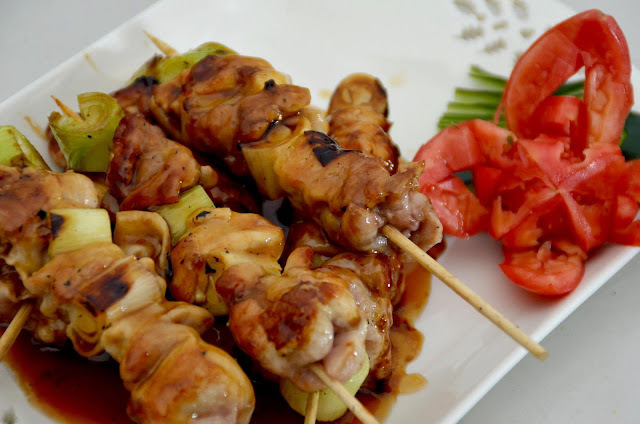 Following the salad dish is Chicken Yakitori with Teriyaki Sauce. Even those who are not partial to chicken will think twice as this dish possesses the power to make beef lovers go chicken. The skewered goodness of this dish truly defines the fun of summer. 1. Thread on bamboo skewers alternate chicken and leeks two pieces each. 4. Broiled the skewered chicken (Yakitori) for two minutes turn one side for 2 minutes then brush with yakitori sauce from time to time until done. 4. Place on plate pour over the top with the remaining yakitori sauce. 5. To make the Tereyaki Sauce, broil or roast in oven chicken bones, carrots, ginger, white onion, until dark brown. 6. Have ready oven heated 350°F place the green onion leeks until became a charcoal color and set aside. 7. Have ready sauce pot, combine the chicken stock, Kikkoman, white wine/vinegar mixture, sugar, chicken powder, allow to boil, then add the broiled vegetables and lastly the broiled chicken bones. 8. Reduce the flame and simmer for 30 minutes to 1 hour. 9. Strain into the fine sieve to the sauce pot until boiling then you may pour dissolved corn starch until light thick and glossy, season to taste.